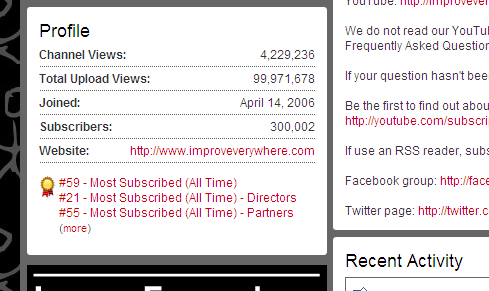 Improv Everywhere is about to pass 100 million total views on YouTube! We joined the site in April of 2006, about five months after YouTube started. While it feels like we’ve *always* been on YouTube, Improv Everywhere existed for four and half years before we had a YouTube channel (and for about four years since.) Without YouTube, we’d still be documenting our missions with just text and tiny photos. YouTube has enabled Improv Everywhere to reach an international audience without needing a green-light from anyone but ourselves. So, hooray for YouTube! We’re also on the cusp of reaching 300,000 subscribers on YouTube. To celebrate, we’d like to give away something special to the 300,000th subscriber. The first person who posts a link in the comments below to a screen shoot of Improv Everywhere’s channel after we’ve passed the 300k mark will win the last remaining Improv Everywhere Best Buy Blue Polo shirt. Yup, the shirt that is so illegal to sell we got a cease and desist letter about it! Only 24 of them were ever made. 12 were sold and 11 were given out as gifts to senior agents. One adult size small remains! Be the first to post a screen shot of our YouTube channel displaying over 300k subscribers and the shirt is yours. And if you’re not a subscriber to our channel, speed this contest up and subscribe now! UPDATE: We passed 300k and have a winner. See comments below. Thanks to everyone who tried to win! And thanks to everyone who subscribes to Improv Everywhere on YouTube!!! Do you have to live in America? No, I’ll ship it overseas if I have to. Though it might take several weeks. Germany is really a good place to live. Woops… did not read the instructions carefully. how do you post a screen shot? it’s not even at 300k yet! oh…you haven’t hit 300,000 YET. how do u make/capture a screen shot? CONGRATS, do you have a size large? So, by “passed the 300k mark”… would a screenshot of 300,000 and/or 300,001+ etc. be acceptable? Haha – nice fake. I’m watching though. I’ll know whether it’s actually crossed 300k or not. can the screenshot be hosted anywhere? are we simply to let you know of the url of the screenshot? Shift and command and 3 takes the whole screen. Shift and command and 4 lets you select the part of the screen that you want. Upload just like any other file. Testing the comment posting for speed. Also, I keep getting the error that I am posting too quickly, even though this is my first post here. of course, now I have to go get kids from school… so NOT fair! Did the legal advice ever help? I had suggested that you had a case against BestBeast based on the shirt being a parody and the tag shape being used in other ways besides a company logo. Congratulations to you on the success of IE and thank you for entertaining me. The few missions I’ve been in have been tons of fun. I decided just to take the shirts down and not worry about a legal fight. There’s a chance we could have won– I think it’s clearly a parody shirt– but I didn’t have the time or the money to get into a fight with Best Buy’s lawyers. Plus, the C&D letter caused such a huge stir online (especially the one they sent Laughing Squid) that I won in the end. We got tons of traffic from it. We only made 24 shirts anyway. Thanks again for offering to help out! so the shirt is an adult small correct? If someone were to post 300,001 and then someone else posted the 300,000 which person would win? The first person, based on the time stamp on the comment to post a screenshot of 300k or more. I considered that. But the image had the number of total views correct as well. That number doesn’t change with each view, but it had been updated pretty recently before the 300,000th subscriber. So if he made a fake, he made it pretty quickly before and he posted it the second it went to 300k. And he seems like a nice dude so I’ll trust him! Posting too quickly my ###!!! Darn, I kept getting a “you’re posting too quickly” message! Hooray :) Awesome thanks guys! I think I won by about 5ms, haha. Thanks to everyone who tried! And thanks to everyone who subscribes to Improv Everywhere on YouTube!!! New videos coming soon! Here is the 300,000 mark but the system said I was uploading too quickly??????? wait thats not right, the winner was one over, my image is exactly 300k. I made it clear above that it didn’t matter if you were over. Congrats on the 300K Charlie & Co! What’s up for the 1 millionth view? Yes, the exact same copy we played in The Moebius. ON CASSETTE. ooh, 500 subscribers overnight. THats interesting. Check out the new episode of Real to Reel featuring Charlie Todd! In this episode, founder Charlie Todd brings the MP3 experiment to campus where students download an MP3 to their iPods and follow commands such as playing thumb war, napping on the ground and high-fiving strangers.